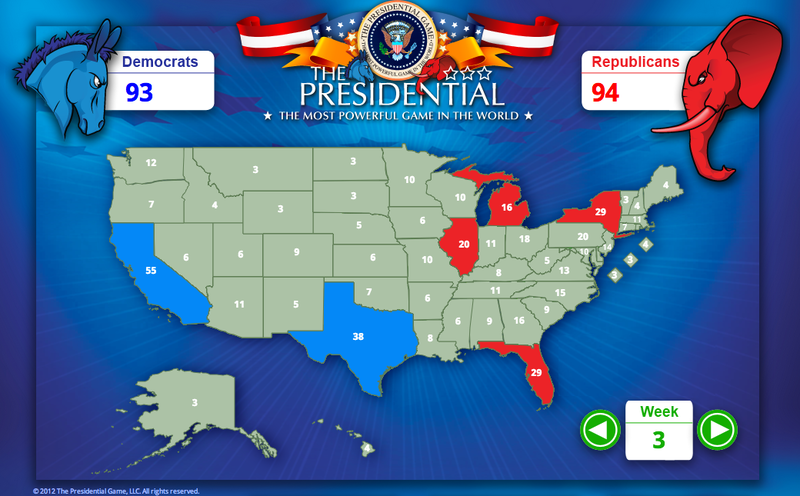 I think one of the most confusing things about the election process in the United States is the Electoral College. I don't think it *has* to be confusing, but most of us don't know that much about it. We think when we vote for the next President, and we watch the little maps change color on TV, that the President has been elected when the popular vote has been decided. Not so, my friends, not so! There is an important little organization called the Electoral College, and THEY get to make the final decision. Granted, they almost always vote according to the popular vote - but almost is a key word. 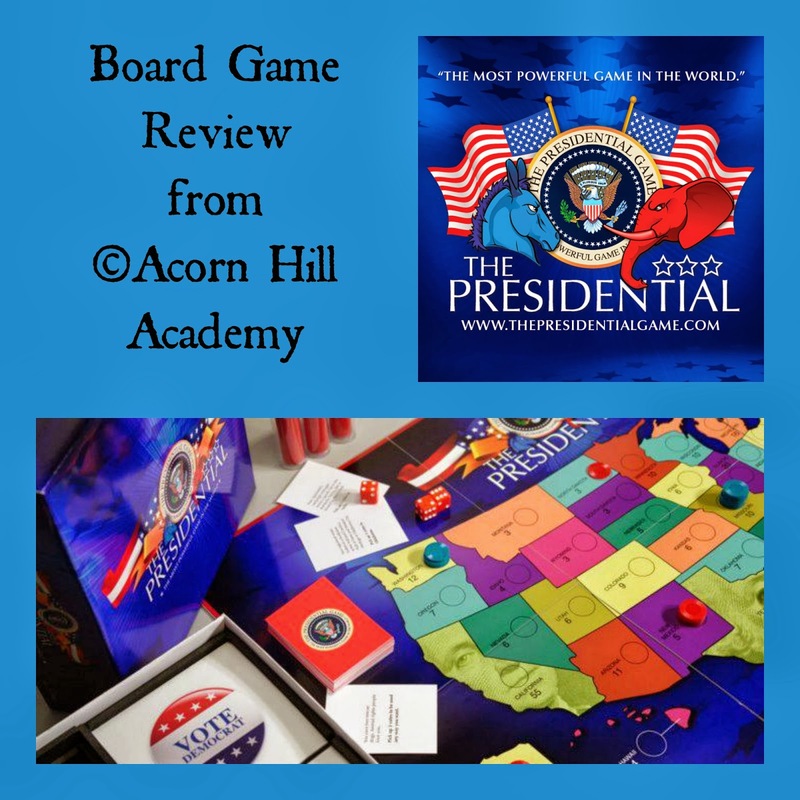 I love anything that makes learning fun, so I was thrilled to have the opportunity to review The Presidential Game. It's a board game for ages 11 and up that takes you through the campaign process. There are two teams, naturally, Republicans (red) and Democrats (blue). Each team has their own chips and set of color-coordinated dice. At each turn, you have a choice to fundraise or campaign. You roll the dice to see how many votes you get to use on your turn, and place chips on your chosen state in the hope of taking control of that state. You keep track of your electoral college votes on the included score pad, which is good, because the number of chips you use does NOT indicate the number of electoral votes in your control. The game requires strategic thinking and planning - do you want to try to control key states, or do you want to control as many states as possible? If you want to be in charge in California, you're going to have to use a lot of votes there. Is it worth it? Only you can decide as you run your campaign. The Politics Cards add a little twist to the game. If you choose Fundraising on your turn, you have to take a Politics Card at the end of your turn. Most of them work in your favor. They might say something like "Your opponent wore loafers to a fundraiser at the National Cowboy Hall of Fame and Western Heritage in Oklahoma City. Add 3 votes to Oklahoma." Every now and then, though, you get a card that gives votes to your opponent (your uncle got publicly drunk, say), and sometimes both sides lose some votes (some upstart independent threw their hat in the ring and messed everything up). There are even some blank cards so you can make up your own Politics. I confess to feeling a bit gleeful at the thought of the things we can come up with to write on our cards. The first time we played, Isaac kindly laid out his blankets on the floor for us. Wasn't that nice of him? Abbie was torn between wanting to play with blue chips and wanting to be Republican. Emma, my oldest, was paired with Isaac, my 6 year old, and he was not even a little bit interested in the game, so he and I had our own little game on the side with his Squinkies. He would give me one every time I did something "bad," according to him, and I would occasionally ping one back at him across the board. We like to keep things interesting. Heh. One really cool feature of this game is the WebMap Calculator. When you open your game, it includes a code to give you access to an online map. You tap on the states to change their color according to which party is winning there. It looks just like the one you see on TV during election night. It's a lot of fun to use. I had it set up on my iPad while we played. It's neat to watch it fill in. The game instructions say that a 30-week election cycle should take about an hour, but we had to play shortened versions with Isaac around, because he made it difficult to concentrate. He only wanted to fundraise, which made Emma's campaign efforts interesting. One of these days we'll get to play when he's busy doing something else. This is a great game! 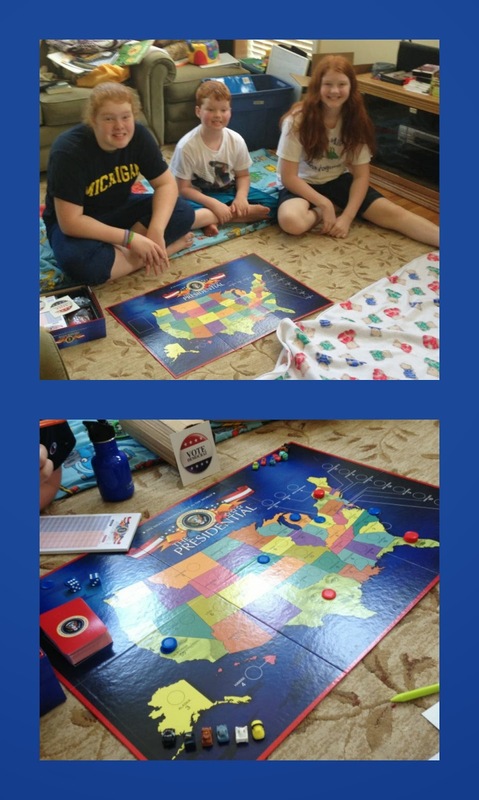 If you love politics, or you don't (I really don't); if you want to teach your kids about our election system or are looking for something to make government studies a little more fun - take a look at this game. The Presidential Game is available for $35.00. It's a high-quality game board with nice pieces. You won't be disappointed!